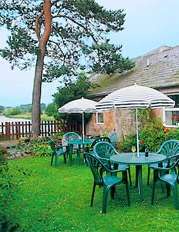 Riverside Cottage (sleeps 2) - This is the smallest of the 3 riverside self catering holiday cottages, it is often let as additional hotel accommodation. This is the cottage closest to the river, directly over the river, it is slightly elevated and safely fenced, so you have terrific view from the living room, through the large patio doors up the river to the North. The Patio gets lots of afternoon and evening sunlight and has some wonderful sunsets. The accommodation is very well maintained with a galley kitchen, living room with new sofa and armchair and a large double bedroom, complete with very large king sized bed. 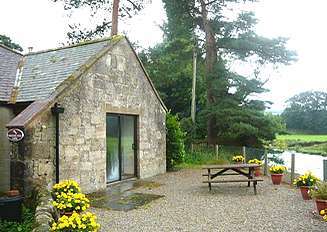 Originally converted from a barn, you will be very comfortable, relax and enjoy the wonderful views. 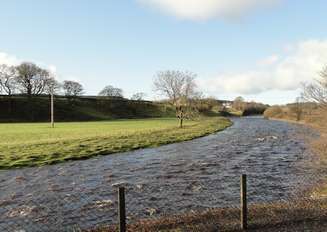 The greatest features of this cottage are it's own patio and the magnificent view from the patio doors right down the River Nith (the photo above was taken from the patio). 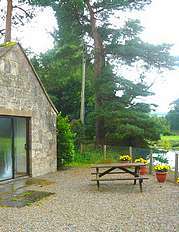 The patio itself is directly above Ministers Pool, a very prolific and popular salmon pool after which the cottage is named. Tastefully decorated and furnished to a high standard, the cottages stand adjacent to a small country house hotel offering a cosy bar, outstanding food and beautiful gardens. Riverside Cottage is the end one of the three cottages, it overlooks Ministers Pool the salmon pool right outside the door. It has a large and spacious, comfy sitting room/ dining room with well equipped fitted kitchen. 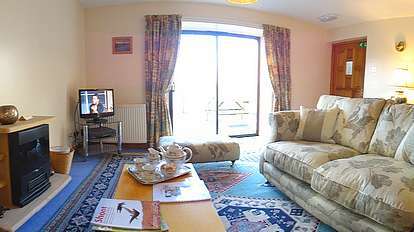 Furnished to a high standard with large comfortable sofa and easy chairs. The kitchen is fully equipped with electric cooker, dishwasher, fridge etc. and breakfast bar. 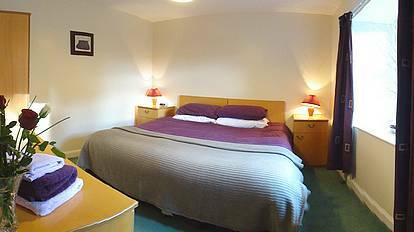 The bedroom is very large with an en-suite bathroom. It is set either as a double or a twin. The bed being zip and link form into a super king size or into comfortable singles. Extra beds and cot are available.